Married by Christmas by Karen Kirst is the fifth book in Smoky Mountain Matches series but the first that I have read. Though we meet some characters from the previous books, overall I felt that I could easily read this book as a standalone. However, it is always best to read books of a series in order so you understand the back stories better. I know I will be reading the previous books. This is the story of Rebecca and Caleb who have a history. Caleb did something that led to Rebecca's engagement getting broken. Now wounded, he is saved by Rebecca who nurses him but then they are faced with a difficult situation where the only way to save their reputation is to marry each other. I enjoyed both these characters who are both good people who suffered due to circumstances being against them. This book is about second chances, forgiveness and the power of faith. There is also suspense, danger and the simple celebration of Christmas with the focus on the Savior's birth. The story is fast paced and I enjoyed Karen's writing style. She sketches 1881 so beautifully that I could easily visualize the world as it was then. 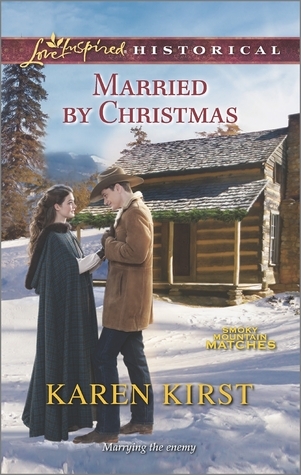 All in all, Married by Christmas by Karen Kirst is a sweet love story about love, forgiveness and having faith in God. 4 out of 5 to it and recommended to all Christian romance and historical romance lovers.